Mud season: a boot-sucking, slippery mess. Many look forward to mud season as a sign spring has arrived, but it can also be an inconvenience and a hazard when hiking the trails. While there is no official start or end date, the Adirondack mud season usually runs from the first of April until the middle of May. This is a time when snow is melting off the mountains, creating large amounts of mud and erosion. When mud season is at its worst, New York State often asks hikers to stay off some trails. In fact, hikers are encouraged to postpone their spring hikes on any trails that are above 3,000 feet until about mid-June to allow the trails to fully dry and harden. 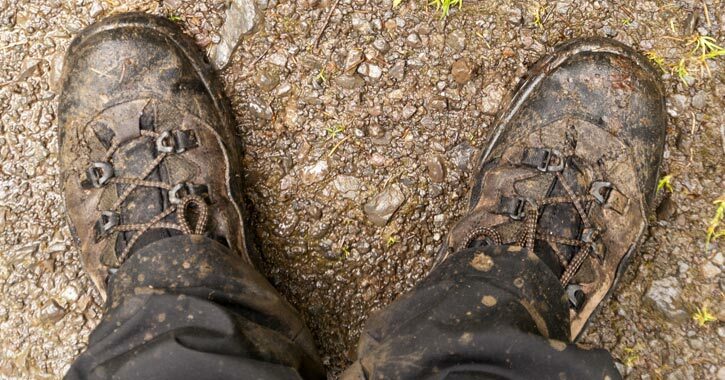 While hiking in the mud can pose a danger to hikers, it can also cause damage to the environment. One of the biggest issues with mud season is that hikers can destroy trails and damage vegetation. When hiking, we see mud and immediately think - how can I avoid this? This leads to hiking off-trail. When hikers travel off the marked trails, particularly in the High Peaks, it puts plants in danger of being trampled and destroyed. A typical lawn can be stepped on up to 500 times before damage becomes visible, but delicate alpine plants can be damaged after only 5 steps! Therefore, vegetation found on alpine areas of the Adirondacks become threatened during the mud season. And while the alpine summits are the most vulnerable areas to vegetation destruction, hikers need to be aware of this issue on the lower elevations as well. Your best bet is to always walk in the middle of the trail, even when it's muddy and messy. *If you're determined to hike the High Peaks during the spring, don't forget to check out the latest High Peaks trail conditions before heading out the door, and be prepared to stay on the trail and in the mud.